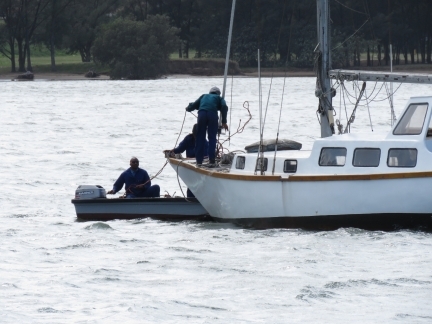 Once the big storm was over, we med-moored again to the Zululand Yacht Club wavebreak. While we’d prefer to be either swinging free at anchor or secured to a dock, this is working out remarkably well and the yacht club is a good base to operate from. Days later, we’re still seeing debris and reminders of storm damage. The winds are still up, but the worst of yesterday’s big storm now is over. 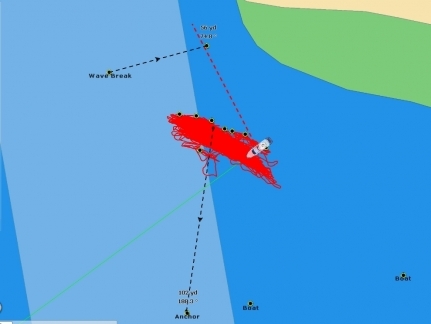 This screenshot shows how we moved around at anchor for the past 24 hours (click image for a larger view). The marks on the chart show our anchor at the bottom of the shot and the outer edges of the swing area to guage if we are dragging. We use a 70kg (154lb) Rocna and had 200 ft of 7/16″ high test chain that is roughly 2 lbs per foot. So, in aggregate we had around 554lbs deployed and held very well. The storm was unusually intense for Richards Bay–some are saying it was the worst in 8 years. Port Control recorded gusts of 65 knots yesterday morning. And the storm blew dry the St. Lucia estuary, a popular hippo-viewing destination just north of Richards Bay. This sailboat was moored fore and aft nearby, and the forward mooring parted in yesterday’s storm. A crew was out trying to re-attach it this morning. We weren’t particularly tempted to go on a mooring for the storm, partly because we didn’t think they were strong enough but mostly because we much prefer our own ground tackle in these situatiion. Seeing this we feel even better about our decision now. 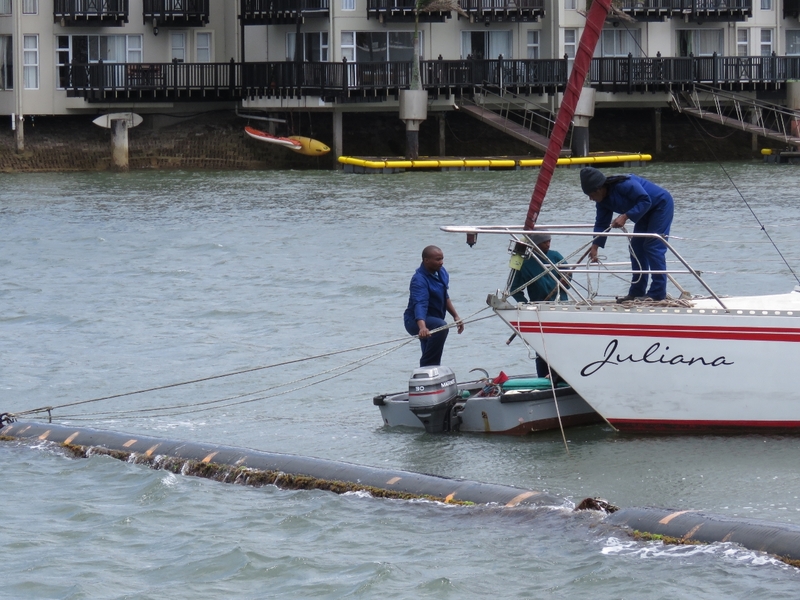 A crew was out checking and replacing lines on the sailboats moored to the Zululand Yacht Club wave break after yesterday’s storm. 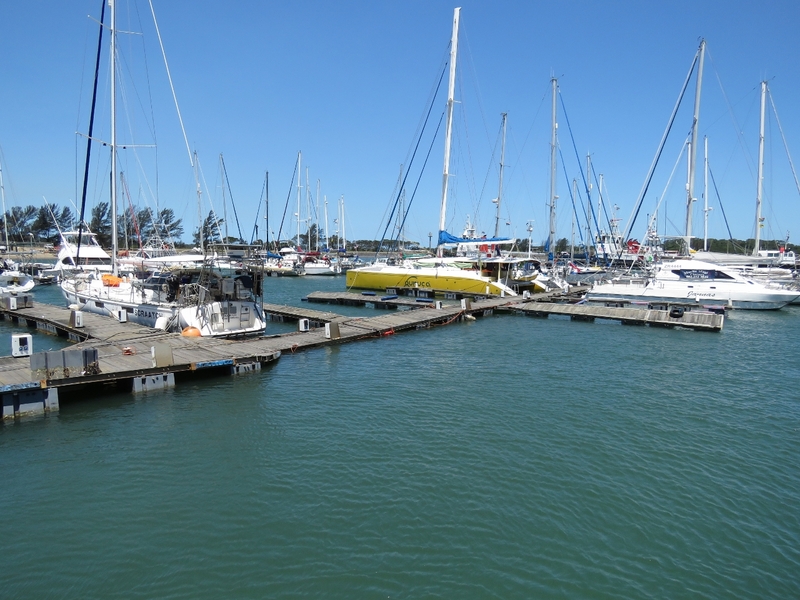 Now that the big storm is over, we’re back Med-moored to the Zululand Yacht Club wavebreak. There isn’t sufficient space to swing if there is a large wind shift, but it was fine for the direction the storm was blowing. To secure the stern, we attached shackles to the wavebreak and ran two 75-ft lines through the shackles and back to the boat. This turned out to be a good setup as we could easily release the lines yesterday morning from on-board to come off the wavebreak when the winds picked up without have to get the stern close. Today we just re-ran the lines back through the shackles. Getting the stern up to the wavebreak to run the lines was a bit of a challenge, with 20-kt winds gusting to 30 kts. We are really glad to have hydraulic thrusters as we leaned on the thrusters for about tens minutes getting both lines tied off. We drove over to the Tuzi Gazi waterfront for lunch. The docks at the marina appear mostly repaired now after the big storm. The section that had buckled is about dead center in the picture. One of the reasons the dock is so fragile is that the piers are anchored to the bottom rather than held in place with pilings. 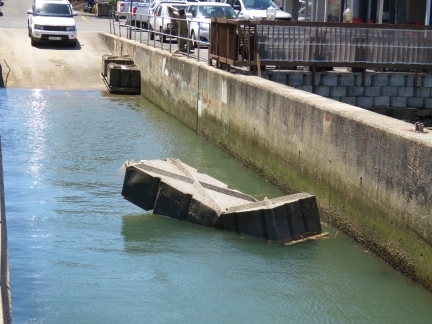 Various pieces of broken dock were secured to the shore around the marina area. 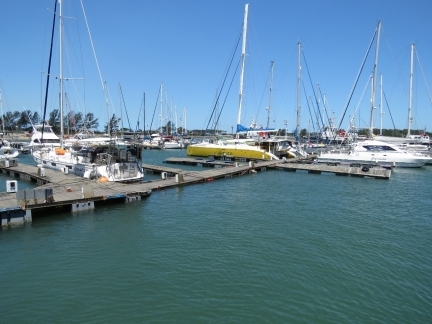 The Zululand Yacht Club has a slipway and yard where at least a couple of dozen boats are hauled out. Their boat hoist can lift up to 30 tons and is mechanically-operated rather than the more common hydrualic lifts. 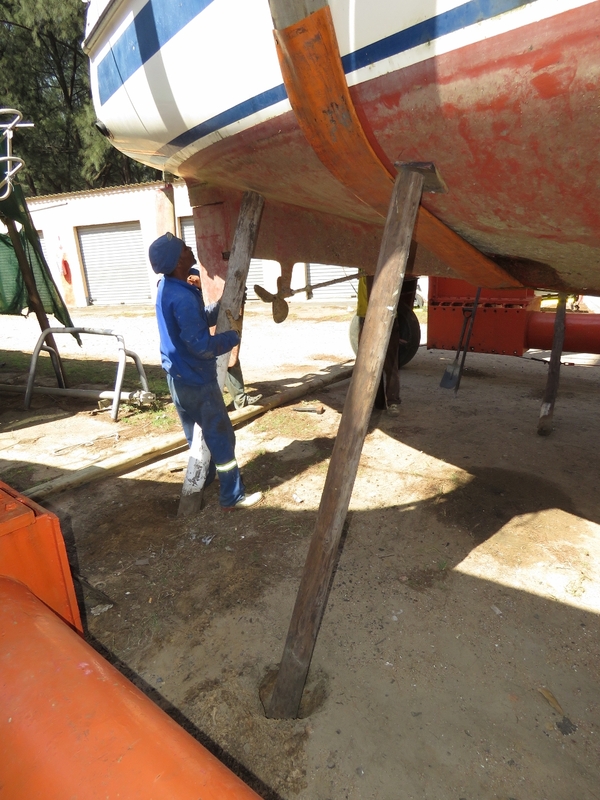 Here the yard crew is installing support poles under a freshly-hauled vessel. This Mclaren parked at the yacht club for the past few days gets a lot of attention. There’s lots of burning in the area, and we’ve been getting tendrils of soot on and inside the boat. The plus side is that the hazy sky makes for some dramatic sunsets. This micro-helicopter flew over the anchorage. It looks pretty fun, but doesn’t appear to offer a lot of safety margin. We went on a dinghy tour of the area today. The river shallows up relatively quickly, so we couldn’t get very far upriver. People were fishing on shore or by boat everywhere we went. 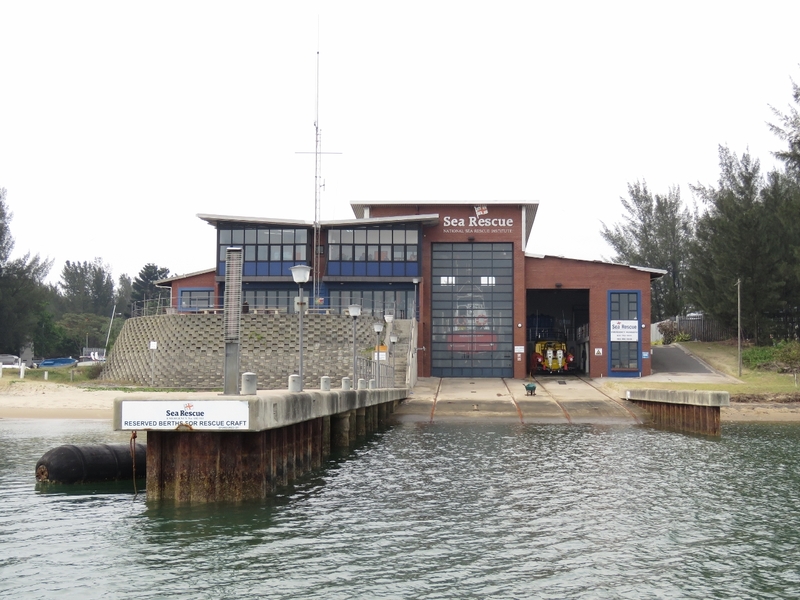 The Richards Bay Sea Rescue station is near where we are anchored. They have a couple of very capable-looking boats pulled up inside. 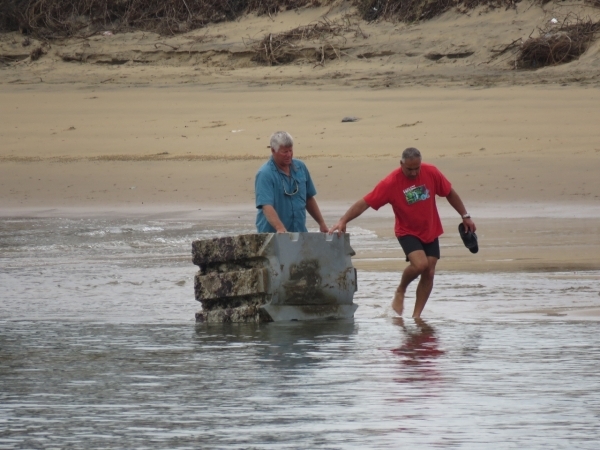 These two men were salvaging a piece of marina dock that had likely escaped during the storm. From our anchorage we can see the ships entering and leaving port. The pilots typically are dropped off and picked up near the harbour entrance by helicopter. 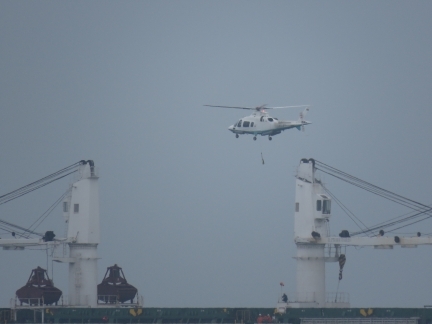 Here a lift sling is being lowered down to the deck of a departing ship. That must be exciting when the sea is up. Well hello South Atlantic Ocean…..that is a new first! Congrats! Love watching your journey. It’s great to be in a new Ocean. Interesting observation, on the way south in the Algulhas current the water temperature was running 92 to 99F. Now that we are in the Atlantic, it’s down around 85F. We plan to enjoy Cape Town for a few weeks and then start the run across the Atlantic. Glad to see you made it to Capetown. With that kind of weather on that southern tip, think I would rather cross the big oceans where it seems a lot safer. :) Same thing though around S America so stay safe. Back home… what you are missing, of course, is rain, fairly strong winds taking trees down and the power with it and a touch of – finally – winter in the mountains. Race Rocks had about 55 knots of wind yesterday and it was fairly strong through Admiralty and elsewhere. Cheers! I heard about that wind storm that just went through the area. Yes, that last PNW storm is deffinitely worthy of mentioning. I’ve been through the high currents of Race Rocks many times and it was often “interesting.” I can’t imagine what it would be like with those big currents running against a 55 kts wind. We’re just waking up to a beautiful day in Cape Town. (couldn’t find another way to send this one). CONGRATULATIONS on getting ’round Alguhas! Thanks John. It’s great to hear from friends back home. Cape of Good Hope in 6 hours and Capetown this evening if conditions hold. We’re looking forward to it — we feel like we have spent a lot of time at sea over the past 3 months. Alex, you were asking bout the course change and slow down. We are slowing down because we have left the Agulhas current. The current swings away from African in this area so most boats rounding the cape leave the current somewhere in this area and proceed westward. We are running with more commercial traffic than we have ever seen at sea mostly because there is massive traffic between the Indian and Atlantic oceans and it all has to pass here or the Suez Canal. Most of the traffic appears to be on a similar course. The ride is great so no problem there. We are thinking of ducking into for shelter today and waiting about 24 hours for a minor low to pass. Winds are predicted to run around 25 kts for a day or so. Not that bad but we are thinking through options. We may press through it, we may go to Knysna, or we may try Plettenberg Bay. Going directly to Cape Town would work but if the winds are predicted to be 25 kts, they could get worse. The weather is very fast changing here. If we stop, we could go to Knysna which is reported to be very nice but difficult to enter. 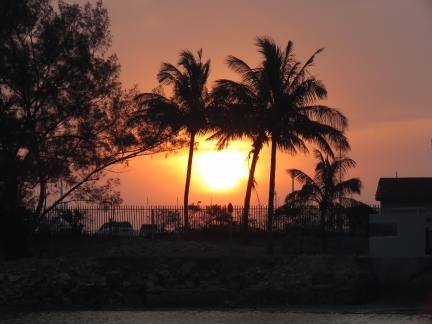 Reports I’ve read have it called “one of the 10 most dangerous ports in the world” and it is reported to be unsafe to enter if more than a 2m swell is runnning. Plettenberg is easy to enter but not very sheltered. At this point, we’re not sure and are watching the weather closely. The weather is looking like we are going to see one period of 12+ hours or so at 25 to perhaps 30 kts. It’s not really that much wind but it’s the Southern Ocean and things change in a hurry and the system could intensify so we are inclined to delay slighty. We could go into Knysna or stop off at the fairly exposed Plattenberg. Of the three options, we’re currently leaning towards a short stop at Plattenberg but we’ll make a final call in the next couple of hours. Alex, you nailed the reason we are running so hard and why we left so early from Plettenberg Bay. We were at Plettenberg unilt a small low past and then left at 3:30am to be able to make Cape Town just before another big low comes through. Normally we don’t like running as close as we are to weather systems but, we are learning, in the Southern Ocean, take the windows you can get. We just past the souther most tip of Africa, Cape Agulhas, earlier today. We should pass Cape of Good Hope in about 6 hours and arrive in Capetown around dark. This is a good example of why it’s sometimes nice to have more power. We have done this untire run around the souther tip of Africa at around 195hp. The fuel economy is far from impressive but getting it done between low pressure systems is what we want. Fuel be damned! 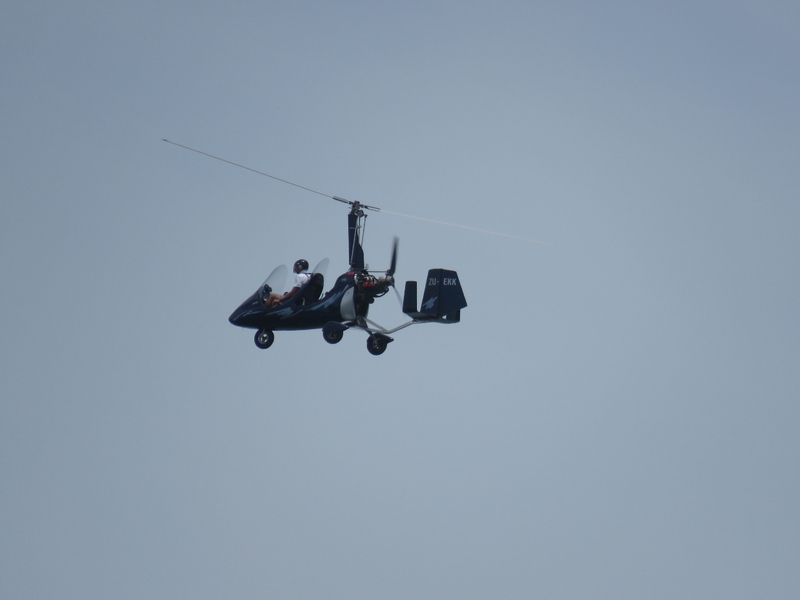 That “micro-helicopter” by the way is a peculiar contraption more properly called an “autogyro”. Thanks Frank. I haven’t looked up the actuarial life expectancy of a Autogyro pilot but, from listening the engine sag and slowly recover on turns, it sounds very close to the limit. It sure didn’t sound like it had much engineering safety margin. But, I would really, really like a helicopter. Perhaps I’m lucky that even a small chopper wouldn’t fit on Dirona. Wow that must have been a bit scary. I saw that you had stopped and was curious as to why and now I know. Glad you made it in safely and hopefully the repairs will be easy. I know you 2 will take photos so will keep an eye out for those. We were planning to stop here since we’re learning it’s just about impossible to get more than 2 to 4 days of passable weather before the next low comes through. But, even if we were not planning to stop, we would have :-). Next stop is likely goig to be Knysna unless we get more lucky than I expect and can make Cape Town before the next low passes through the area. From everything we’ve been told Knysna is well worth the stop even if the weaterh doesn’t force it. WooHoo!!! Your on the move!!!! May the weather work with you this time. So fr, so good on the weather. We probably will stop for a day on the way to Cape Town to let a day of 25 kts pass but we’ll make the final decision on that later in the day. Conditions are great. The commercial boat traffic is the highest we have seen anywhere. So many boats rounding the cape between the Inidian and Atlantic Oceans. There are always at least 5 in our general area. Have to correct myself as I see I wrote that wrong about the wind. So to correct my question then was the wind and current in your favor or just using higher rpm? The maximum speed of Dirona is 9.5 kts at full power output. We were, as you note, doing 11.5 kts at the peak. It’s current all the way Tim. 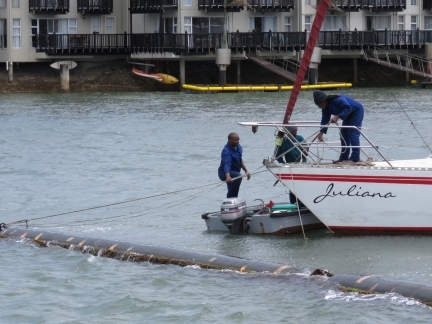 The Agulhas current is one of the strongest two in the world and it runs as fast as 6 kts. The good news is you can get a high speed ride south. The bad news is if the wind comes up from the south, it is one of the most dangerous waters in the world with 20m seas reported. 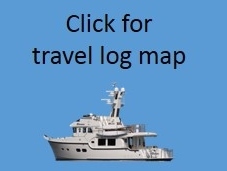 Many boats have been lost to rogue waves in the area up over 30m. We got our own little introduction last night where the winds went from moderate to 25 to 30 kts in secondsd and the waves stacked up imediately. I’ve never seen seas develope so quickly. 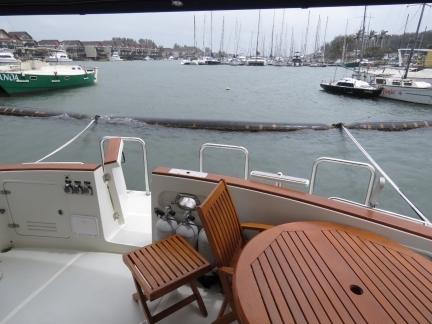 We took the hardest green water hit to the forward windows of our boat ever. So much force it tore off the latch and gas strut holding a forward storage area, bent the barrel bolt on the portugues bow door, and actually forced water through hatch seals that never leak. It hit us like the proverbial ton of bricks. We plan to wait out the storm in East London. Been following the movement of the boat as usual and am impressed by your speed. Before I closed my eyes for the night last night you were doing almost 10 knt with the wind coming from the ESE. 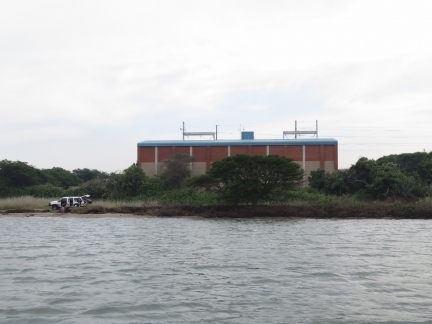 Is there a good current from the North? Now today as I wake up you are cruising along at 11+ knts. So are you running the rpm’s faster for this leg or is there a current? If you can get to one, I think you would find it a fun day out. Thanks for the pointer David. In this case, as much as I’m sure we would enjoy trying a Land Rover, visiting the plant would be even more enjoyable. If the weather goes as predicted, we’ll be leaving Richards Bay tomorrow morning after a very enjoyable visit and start working our way south towards Cape Town where we will spend December. 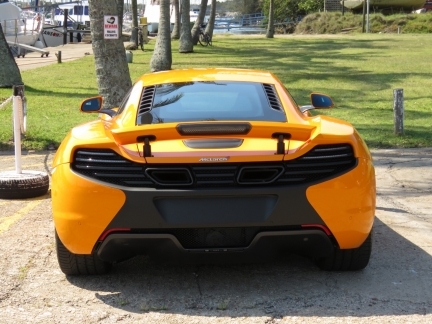 Interesting to see the McLaren at the marina – it looks like a 12C. If you have not been following McLaren, you may be interested to know that that have been releasing a series of new cars. After the super cars they have now launched a sports car range, the 570S. Given your interest in all things electronic and the Bell products, you might enjoy exploring what is offered at the other end of the automotive spectrum. For many of the higher end products it is now possible to set your vehicle up for different driving styles (road or track) which will alter suspension, throttle response, steering, speed of gear changes and so forth with a simple control. McLaren. like many others, will do this for you. Land Rover were also a pioneer in setting up what they call Terrain Response for off road conditions, which adjusts ride height, throttle response and so forth depending on whether you are travelling through mud, or sand or over rocky terrain. They also offer a wade sensor option which measures the depth of water you are in and alerts you if you are too deep – the current Range Rover is OK up to c3 feet. Because all most all vehicle features have software at teh core and vehicles are now interconnecting all the software systems, central control is possible and the vehicle performance, economy, ride and other features can be tuned to current conditions. Pretty impressive. I wasn’t up to speed withh the latest Range Rover software you described David but it makes perfect sense. 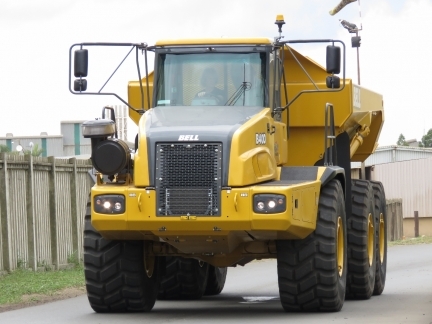 The Bell Equipment trucks do a variant of that by changing transmission shift points and locking up the differentials when conditions require it and leaving them free for better tire wear and fuel economy when not. The entire world is becoming software defined. Thanks for passing on the McLaren and Range Rover features. When we arrive in the UK, I’ll have to see if we can Range Rover to our list of technology tourest locations.